You'll explore the less-touristy side of things at Archaeological Zone of Xochicalco and Cosmovitral Jardin Botanico. 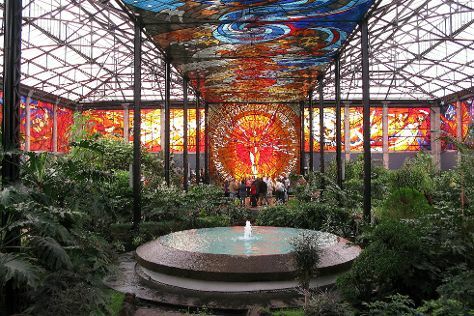 Get out of town with these interesting Mexico City side-trips: Jardines de Mexico (in Jojutla) and Tula (in Tula de Allende). The adventure continues: don't miss a visit to Murales de Diego Rivera en la Secretaria de Educacion Publica, wander the streets of Ciudad Universitaria, examine the collection at Museo Dolores Olmedo Patino, and explore the wealth of natural beauty at Chapultepec Park. For traveler tips, maps, ratings, and tourist information, you can read our Mexico City trip itinerary planning tool . If you are flying in from United States, the closest major airports are Licenciado Benito Juarez International Airport, Querétaro Intercontinental Airport and General Francisco J. Mujica International Airport. In May, plan for daily highs up to 79°F, and evening lows to 56°F. Finish up your sightseeing early on the 28th (Mon) so you can travel back home.